We work with the best brands in the industry! Get your quote today! There are many benefits to installing a new gate system. Not only will an automatic gate improve the security of your property but it will also make day-to-day life more convenient. Our organized team will handle all aspects of the new gate installation project from beginning to end, making the process as hassle-free as possible. The first step is to decide which unit suits your needs. One of our technicians will carry-out initial checks to identify any features of your property which could affect your choice, including uneven terrain or potential obstructions. Automatic gates are generally made from either steel or wood with each presenting their own benefits and disadvantages. Wooden gates offer a rustic and traditional aesthetic but require more maintenance, such as regular repainting. While steel doors are durable and lower maintenance, they are subject to rust. Our team can help you to decide which option suits you best and then expertly install it so that it functions efficiently for years to come. Are you looking to upgrade your current gate opener? Then contact our knowledgeable team, who can talk you through the various options available and schedule an installation appointment. We carry a wide range of the latest makes and models compatible with both swing and sliding gates. What’s more, our installation service does not only cover the motor unit but also all relevant hardware components and accessories. After installing your chosen opener, one of our technicians will carry out system tests to ensure everything is working correctly before they leave. An intercom system is a great addition to your gate system. Options range from basic voice systems which utilize a simple transmitter and receiver, to more complex live video feeds which are able to record and recognize faces. Whichever you choose, you can rely on us to install the device with care and precision. 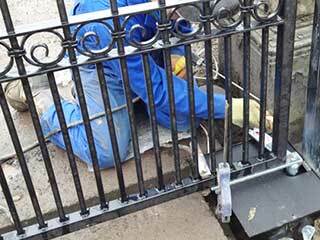 Contact Us Today For The Best Gate Services Near You! For new gate installation projects, no matter how small or large, contact our friendly team at Gate Repair Encinitas today over the phone or schedule your appointment easily online. We are waiting for your call!